The flower and produce show committee spent all week looking at the weather forecast, hoping that Saturday would not turn out as predicted. But to no avail, whilst the morning was dry and bright, the afternoon was cloudy and then the rain really set in. But the entrants and visitors to the village show are made of stern stuff and a little rain did not put them off. 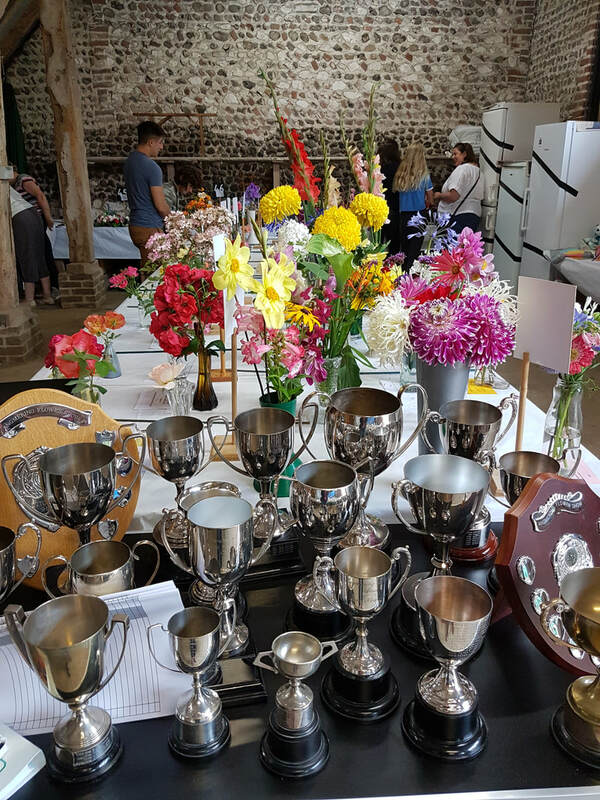 2017 entries were up on the previous year,and we had fine displays of vegetables and cut flowers as well as a wonderful flower arranging display and a huge range of entries for our photography, drawing and painting classes. Our Children classes were well supported as a result of having a crafting stall at the Peter & Paul Fete earlier in July, where the children could make their entries on the day. The result was a colourful and imaginative display of wizards hats, painted stones, decorated jam jars and paper plate dinosaurs that all our visitors were delighted by. Whilst our visitor numbers were slightly down in the afternoon, it was lovely to see familiar and new faces enjoying the show in the barn and having tea and scones in the garden sheltering under the apple tree! Mr Peter Blake our generous host for the day, presented the cups and trophies as usual and we were delighted that our oldest exhibitor, Mr Stanley Edson (age 97) won the Holmes trophy for most points in the Roses classes, a fine return to form after being out of the awards for a couple of years. Stanley is an inspiration to us all and shows that gardening is good for the body and the soul! Despite the weather the show raised more funds than 2016, and the committee will meet soon to decide how they will allocate donations this year to support good causes in the village. In previous years we have made donations to toddler groups, scouts, cubs, brownies & guides along with the Chestnut Tree Hospice fund.